With only a handful of shopping days left before Christmas, you may still be looking for the perfect gift for the comic book geek, action film buff, or Batman fan on your list. Well, look no further. The Dark Knight Rises Blu-ray would make a perfect gift for even the Scroogiest superhero fan you need to buy for. If you haven’t seen The Dark Knight Rises, click here for TJ’s review of the film, and watch out for potential spoilers. Then click here to compare the different versions of the Blu-rays that different retailers are offering. I decided to go with Target’s Blu-ray Digibook Combo Pack. And I’m going to tell you up front that it’s not worth it. I know what you’re thinking: “This self-proclaimed Batman fanatic is bad mouthing the Blu-ray? !” Well, yes and no. Read on to see what I liked and what I didn’t like. Unfortunately, the first thing I noticed about the Blu-ray is the lack of director commentary and deleted scenes. It’s fairly typical for director Christopher Nolan not to do a commentary, but I was hoping since this was the conclusion to his franchise, he would put one together for the film. I also know that Nolan doesn’t put a whole lot of deleted scenes in his Blu-rays and DVDs, but with an original run-time of over three hours, there has to be some footage out there that hasn’t been seen. This one hour documentary gives a brief history of one of the world’s most famous automobiles. 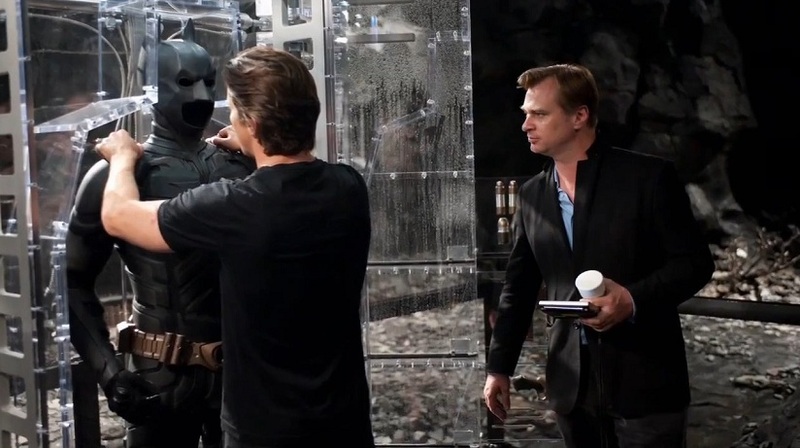 The documentary includes interviews with Christopher Nolan, Adam West, Tim Burton, Joel Schumacher, and others, and chronicles the evolution of the Batmobile from the comics to the silver screen. This section contains the short features: The Prologue: High-Altitude Hijacking, Return to the Batcave, Beneath Gotham, The Bat, Batman vs Bane, Armory Accepted, Game Day Destruction, Demolishing a City Street, The Pit, The Chant, The War on Wall Street, and Race to the Reactor. If you enjoy watching how movies were made, you’ll love these. Each one takes you behind the scenes of specific parts of the movie and gives you insights into what exactly goes into making a film of this magnitude. This part of the Blu-ray gives a little bit of back story to the flim’s characters. The Journey of Bruce Wayne (which can also be found on the DVD), Gotham’s Reckoning, and A Girl’s Gotta Eat all delve into the history of Batman, Bane, and Catwoman, respectively. Shadows and Light in Large Format talks about how the film was grounded in reality and given the IMAX treatment. The End of a Legend gives us a look back at where Batman’s journey has taken him in The Dark Knight trilogy closing the final chapter of the franchise with an ending that honors the previous two films. 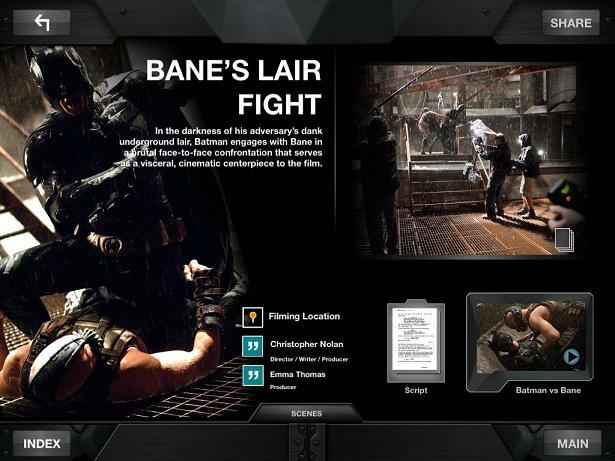 Earlier this month, DC released The Dark Knight Rises FX, available for download on your iPhone, iPod Touch, and iPad. By downloading the app, you gain access to everything from maps, gadgets and trivia to photo galleries and behind the scenes featurettes like storyboards, script selections, digital schematics, and filming location information. The app also gives you links to websites that you can click to learn more about the DC Universe. Think of it as an extra set of free bonus features. Unfortunately, I was not at all impressed with the exclusive version that Target offered. The lenticular cover was nice, the novelty wore off fairly quickly. The thing I was most disappointed about was the comic included in the packaging. I was hoping it would be a comic bridging the gap between the ending of The Dark Knight and the beginning of this film. It wasn’t. 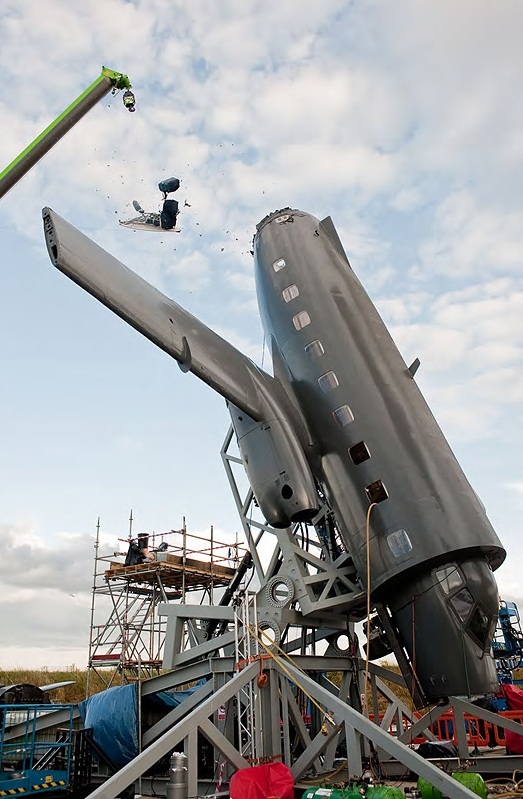 It was a comic version of the first few minutes of the film where Bane and his men take and crash the plane. I‘m only taking away one star for the Target version of the Blu-ray. I wouldn’t bother spending the extra money when the regular version that every retailer offers would suffice. As far as bonus features go, director commentary and deleted scenes would have been nice, but the features included made up for the lack of them. I was glued to my TV for hours watching everything. Make sure to pick up a copy of the film and judge these features for yourself. Definitely buy it! The Dark Knight Rises is a must have to complete the trilogy. I didn’t think that a Batman film could be made that topped The Dark Knight. Whether you are a superhero fan, a Christopher Nolan fan, or a fan of any of the actors in The Dark Knight Rises, this film deserves to be in your collection. I’m a little sad that it’s the last film. Hopefully the future films can stay on par with the universe that Nolan has created.